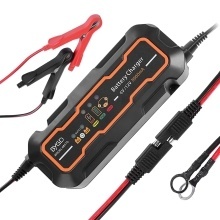 The car battery charger is adoptd full automatic 3 step battery charger with SA charging current. The charger is suitable for oil standard 6V and 12V lead-acid batteries (lead acid, AGM, Gel, CA-CA). Recommended battery capacities: 10Ah to 120Ah, up to 200Ah for maintenance. A LED Indicator informs about the charging step, fully charged or faulty connection. Reverse polarity protection, overheating protection, overload protection and short circuit protection. 6V/12V 5A Smart Car Battery Charger 5000mA is suitable for most Car, Motorcycle, Van, SUV. Please read the instructions carefully before using the battery charger and keep it well for future reference.